The Governor of Arunachal Pradesh Brig. (Dr.) B.D. Mishra (Retd.) has been on a three-day tour of Lohit and Namsai district. On 10th February 2018, the Deputy Chief Minister Chowna Mein called on the Governor at the district headquarters Namsai. The discussed all developmental issues and aberrations affecting the peace and tranquillity of the district. The Governor suggested that the State Government should take concrete step to develop a mechanism to deal with the shortages of books for government schools and distribute to the students before the commencement of the academic session. Sharing his observations during the district tours with the Deputy Chief Minister, the Governor emphasised on establishing of police stations minimum one in each circle of the District. Highlighting the importance of judicial system, the governor also called for establishment of district courts in every district, so that judicial service delivery becomes reachable, prompt and common man friendly. The Governor also emphasised on provision for alternate crops to wean away poppy cultivators from growing the illicit plants at the earliest. 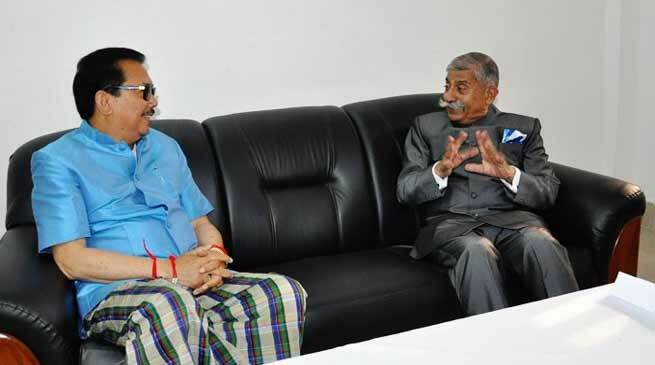 On health sector, the governor discussed with the Deputy Chief Minister to explore the possibility by coordinating with the Union Minister of Health and Family Welfare and Medical Council of India to ask for volunteers on all India basis for deputation to make up for the shortages of specialized doctors in district hospitals. The Deputy Chief Minister assured the Governor to take up the issues with concerned departments for speedy action. Chow Zingnu Namchoom, Parliamentary Secretary Planning was also present in the meeting. The Governor and the First Lady of the State, Smt Neelam Misra, who were accompanied by Deputy Chief Minister and Parliamentary Secretary Planning, visited the Golden Pagoda at Tengapani. They appreciated the rich grandeur of the Temple, its cultural and religious sanctity. Later the Governor and the First Lady of the State also visited the Namsai Pagoda and joined the monks and other inmates in prayer to invoke the blessing of Lord Buddha for the people of Arunachal Pradesh.